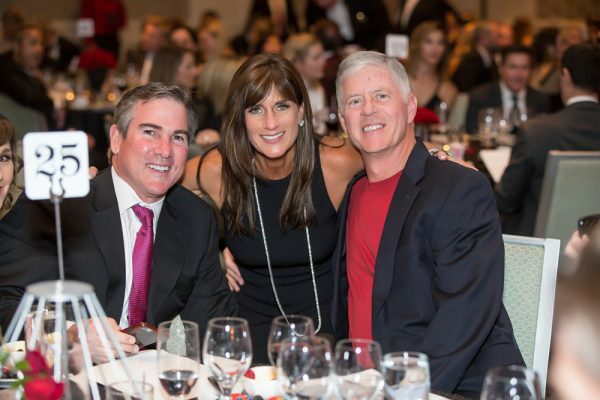 Guests Tom Addis, Holly Wilson, and Jerry Hayden attend Schoolpower’s dinner dance last month. SchoolPower held its 32nd annual dinner dance at the Ritz-Carlton, Laguna Niguel, and raised $300,000 for Laguna Beach schools, says a statement. About half of that amount was pledged towards the 2017 fund-a-need campaign for the district’s student well-being initiative. Presented by Superintendent Jason Viloria and approved by SchoolPower trustees in November, the Student Well-Being Initiative will create a support network for all four schools by hiring a director of student support, two student support specialists and additional interns. These credentialed specialists will help students build resilience to daily stress and anxiety, as well as supporting students who exhibit more serious mental health issues. The support received from SchoolPower will kick start the initiative and the district is committed to continuing this work for years to come, says Viloria in a statement. “This will help create additional opportunities for our students to receive the support they need to become well rounded and successful,” he said. A $240,000 investment from LBUSD is also proposed.